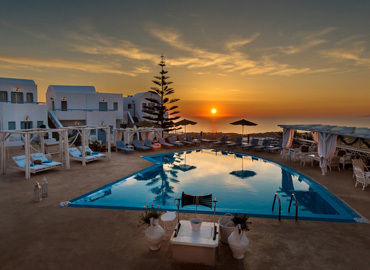 Within a 3-minute walk of the center of Fira, Dream Island is a Cycladic-style hotel with a pool overlooking the Aegean Sea. 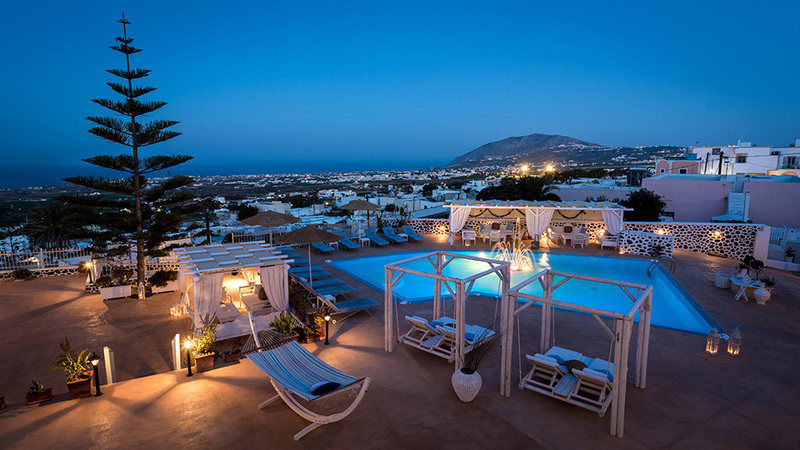 It offers a bar and elegant rooms with balcony and free high speed Wi-Fi. 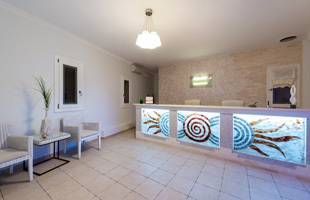 Dream Island Hotel air conditioned rooms are tastefully furnished and decorated in earthy tones. Room facilities include a flat-screen satellite TV, a fridge and a hairdryer. All units enjoy views of the pool and the sea. 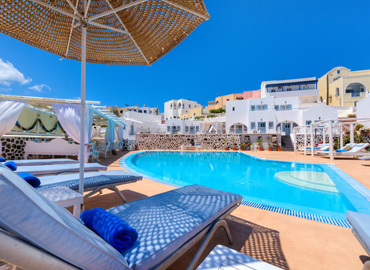 Sun beds and umbrellas can be found around the swimming pool. Lounge areas and hammocks are also available, where guests can relax and enjoy the amazing and beautiful sunrise. 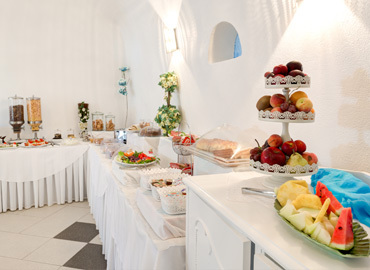 At Dream Island Hotel, your comfort and wellbeing is of the utmost importance. 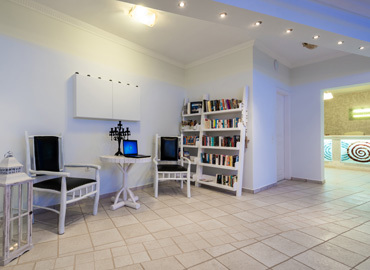 Our business center are at your service allowing you to your job while on holiday. As you would expect, we offers all conceivable facilities for comfort: Wi-Fi, a library of books and a selection of newspapers. 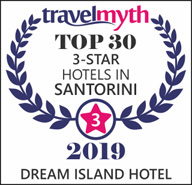 Greek breakfast is an initiative taken by the Dream Island Hotel which utilizes and connects the cultural – gastronomic wealth of the country with pure and unique Greek products as well as with traditional local dishes of the biggest greek island Santorini. 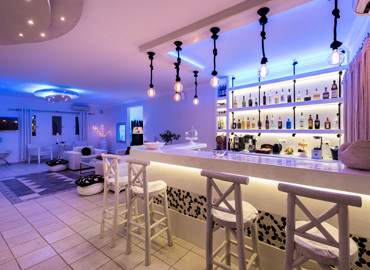 Finish one of your beautiful days in Santorini while enjoying one cocktail or a drink in the lobby area of our family run hotel. 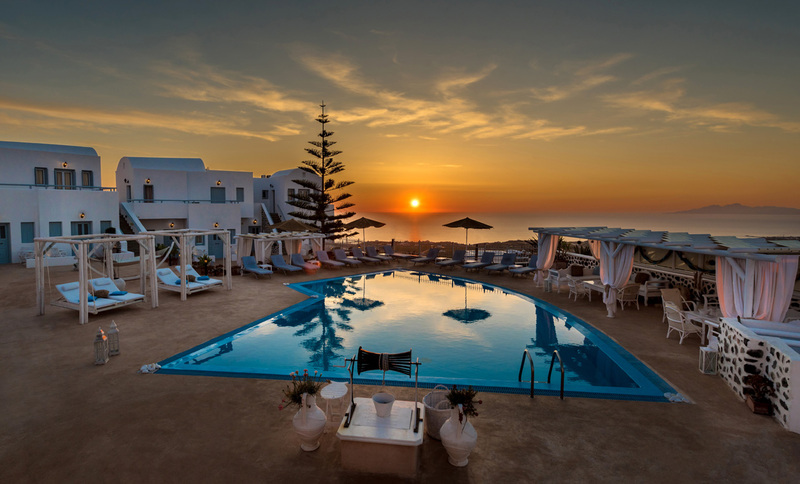 You may also have a little chat with one of the members and feel the Greek Hospitality through our personnel. 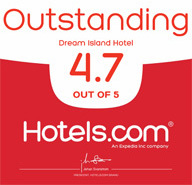 The Dream Island Hotel consists of experienced personnel is at your disposal for anything you need. They will help you with your bags, the tour of your room and for your perfect stay. Room Service is one of the best things about staying at a hotel. 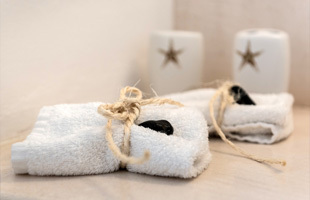 All the rooms are always clean and ready to welcome you and our phone is always available for your immediate convenience. All our hotel rooms have satellite TV which you can use whenever you want with the remote control. You can watch movies, series and television show worldwide. If you are planning to arrive after 10:30 PM please contact the property in advance using the information on the booking confirmation. Airport shuttle service is available on request. Contact the property in advance to make arrangements.